Bishkek, Kyrgyzstan – FINCA Kyrgyzstan is pleased to announce its Client Protection Certification by the Smart Campaign, a global initiative promoting the adoption of high ethical standards in the treatment of clients in the micro financing industry. Through this achievement FINCA joins an exclusive group of 28 certified financial institutions worldwide. “FINCA has always had a strong commitment to microfinancing and client protection. This independent certification provides credibility and demonstrates to our community that we continue to work every day to improve our service and commitment to best practices in microfinance,”- said Margarita Cherikbaeva, the Chief Operations Officer of FINCA Kyrgyzstan. 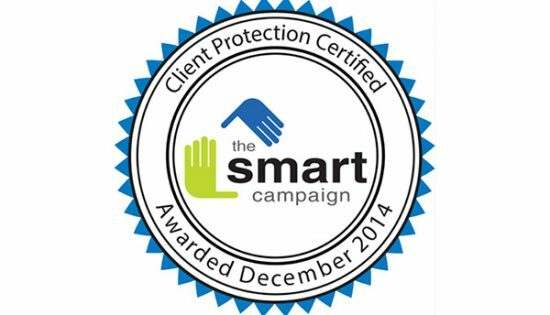 FINCA Kyrgyzstan received the Certification last December in recognition of looking out for the interest of clients through applying the Smart Campaign’s seven Client Protection Principles. The principles at the heart of Smart include: appropriate product design and delivery, prevention of over-indebtedness, transparency, responsible pricing, fair and respectful treatment of clients, privacy of client data, and mechanisms for complaint resolution. MicroFinanza Rating, a Smart Campaign licensed independent rater, was the organization who conducted the certification. Isabelle Barrès, Director of the Smart Campaign, extended her congratulations to FINCA when she wrote on the formal certification: “The willingness to do the work it takes to prepare for and undergo the intensive process of evaluation is indicative of their deep commitment to their clients. The company has shown that this bar is achievable in the area of client protection. Their example will catalyze a movement towards certification within the broader industry”. FINCA Kyrgyzstan has more than 20 years of experience serving low-income entrepreneurs in the country. In 2003, it became the first formal financial institution in the region. Today, FINCA Kyrgyzstan serves more than 125 thousand clients through its 104 branches and offers a variety of services including loans (group, individual, home improvement, start-up, and agricultural), money transfer services, and financial literacy programs. FINCA Kyrgyzstan is a subsidiary of FINCA International, a leading international microfinance organization that provides socially responsible financial services to help low-income individuals and communities build assets, create jobs and raise their standard of living. FINCA currently reaches 1.8 million clients through its 23 microfinance subsidiaries in Africa, Eurasia, Latin America, and the Middle East and South Asia. FINCA’s microfinance subsidiaries are owned or controlled by FINCA Microfinance Holding Company LLC. For more information on FINCA, visit www.FINCA.org.